A microbial polysaccharide (glucuronoxylomannan (GXM)) exerts potent immunosuppression by direct engagement to immunoinhibitory receptor FcγRIIB. Activation of FcγRIIB by GXM leads to the recruitment and phosphorylation of SHIP that prevents IκBα activation. The FcγRIIB blockade inhibits GXM-induced IL-10 production and induces TNF-α secretion. GXM quenches LPS-induced TNF-α release via FcγRIIB. The addition of mAb to GXM reverses GXM-induced immunosuppression by shifting recognition from FcγRIIB to FcγRIIA. These findings indicate a novel mechanism by which microbial products can impair immune function through direct stimulation of an inhibitory receptor. Furthermore, our observations provide a new mechanism for the ability of specific Ab to reverse the immune inhibitory effects of certain microbial products. Glucuronoxylomannan (GXM)3 is the major polysaccharide component of the capsule of Cryptococcus neoformans, an opportunistic encapsulated fungus that causes disease in immunocompromised patients and occasionally in immunocompetent hosts. GXM has profound effects on both innate and adaptive immune mechanisms. GXM can reduce MHC class II expression on APC (1, 2), inhibit activation and maturation of dendritic cells (3), reduce T cell proliferation in the presence of APC (4, 5), dampen Th1 response (5, 6), induce apoptosis of T cells in the presence of monocytes/macrophages via the Fas ligand/Fas system (7), inhibit the production of proinflammatory cytokines by monocytes (8), and induce IL-10 production by monocytes (9, 10). In previous studies, it has been demonstrated that GXM interacts with neutrophils via the CD18 receptor (11) and with monocytes/macrophages via several receptors that include CD14, TLR2, TLR4, CD18, and FcγRII (12, 13). Given that GXM is recognized by natural effector cells, but does not interact with T cells, it is likely that this microbial compound influences the T cell response via signals provided exclusively by innate immune cells, which bind and process the polysaccharide and respond through cell-to-cell contact interactions or by releasing soluble factors. Macrophages express three classes of FcγRs: FcγRI, FcγRII, and FcγRIII (14). Human cells express two functionally different forms of FcγRII (FcγRIIA and FcγRIIB, products of two separate genes). FcγRI, FcγRIIA, and FcγRIII are activating receptors associated with ITAM (15), whereas FcγRIIB is an inhibitory receptor that has an ITIM in its cytoplasmic tail (16). Many immunosuppressive signals described for FcγRIIB such as inhibition of phagocytosis of IgG-coated particles (17), calcium mobilization, and cellular proliferation (18, 19) occur through recruitment of SHIP as its effector molecule. Evidence from several research groups has shown that passive administration of IgG1 protective Abs to GXM can reverse the immune suppressive effects exerted by GXM (20, 21, 22). There are multiple mechanisms by which protective Abs to GXM can induce changes in the immune response that can translate into improved host responses. In particular, the interdependency between humoral and cellular-mediated immunity and the mechanisms through which Abs to GXM regulate cell-mediated immunity have been demonstrated previously (20, 23, 24). Our studies have shown that mouse mAbs to GXM can reverse the negative regulation exerted by GXM 1) by inducing secretion of proinflammatory cytokines, such as IL-1β, IL-12, and TNF-α, 2) by reducing production of IL-10 (10, 25, 26), 3) by promoting expression of costimulatory molecules on monocytes/macrophages, such as B7-1 (1) that are usually suppressed by presence of capsular material (27), and 4) by increasing phagocytosis, enhancing killing activity, and restoring IL-8 released from neutrophils of AIDS patients (28, 29). In the present study we analyzed: 1) the FcγRs involved in recognition of GXM or the GXM-mAb complex; 2) the role of FcγRIIB in the inhibition of GXM-mediated NF-κB activation; 3) the role of FcγRIIB in GXM-mediated inhibition of LPS-induced TNF-α production; and 4) the involvement of FcγRIIB in GXM-induced IL-10 production. RPMI 1640 with glutamine and FCS were obtained from Invitrogen Life Technologies. Mouse mAbs to human FcγRI (IgG1), FcγRII (IgG1), and FcγRIII (IgG1) were purchased from Ancell. Mouse mAb to human FcγRIIA (IgG1) was purchased from Lab Vision. Goat polyclonal Ab to human FcγRIIB (IgG) and rabbit polyclonal Ab to human actin (H-300) were purchased from Santa Cruz Biotechnology. The concentrations of Abs used in our study were: 5 μg/ml for FcγRI, 10 μg/ml for FcγRII, 10 μg/ml for FcγRIIA, 5 μg/ml for FcγRIIB, and 10 μg/ml for FcγRIII. Mouse isotype controls IgG1 (10 μg/ml), irrelevant goat polyclonal IgG (5 μg/ml) and LPS (20 μg/ml), were purchased from Sigma-Aldrich. Fluorescein-conjugated goat F(ab′)2 to mouse IgG (whole molecule) was purchased from ICN, Biochemical Division. Mouse mAb to human TGF-β and mouse mAb to human IL-10 were purchased from R&D Systems. Rabbit Ab specific for phospho-IκB-α (Ser32) and prestained protein marker broad range were purchased from Cell Signaling Technology. Rabbit anti-phospho-tyrosine and rabbit anti-SHIP polyclonal Abs were purchased from Chemicon International. M-PER Mammalian protein extraction reagent and Restore Western blot stripping buffer were purchased from Pierce. WesternBreeze Chemiluminescent Western Blot Immunodetection Kit was purchased from Invitrogen Life Technologies. Actinomycin D from Streptomyces species was obtained from Sigma-Aldrich. All reagents, media, and GXM used in this study were negative for endotoxin as detected by Limulus amebocyte lysate assay (Sigma-Aldrich), which had a sensitivity of ∼0.05–0.1 ng of Escherichia coli LPS/ml. Heparinized venous blood was obtained from healthy donors. The mononuclear cells were separated by density gradient centrifugation on Ficoll-Hypaque (13). Macrophages and dendritic cells were obtained as described previously (3, 30). The human MonoMac-1 cell line (DSMZ ACC 252) was obtained from the German National Resource Centre for Biological Material. This cell line was used for two studies of the effects of GXM on IκBα activation. GXM was isolated from the culture supernatant fluid of strain (CN 6) (31, 32). The concentration of GXM used in our study was 50 μg/ml. mAb 18B7 is an IgG1κ murine mAb that is specific for GXM (33, 34). mAb specific to GXM and mAb IgG1κ (isotype control) were labeled with a labeling kit according to the manufacturer’s directions (Boehringer Mannheim). The concentration of mAb to GXM used in our study was 10 μg/ml. Uptake of GXM or GXM-mAb complex by monocytes and macrophages were evaluated through two experimental approaches. The first approach was used to determine total GXM and GXM-mAb complex uptake. Cells (1 × 106/ml) were incubated with GXM or with GXM-mAb complex, collected, and stained with mAb to GXM or with FITC-conjugated goat anti-mouse Ab (dilution 1/250), and 5000 events were analyzed by FACScan (BD Biosciences) as described elsewhere (35). The second approach was designed to distinguish intracellular from extracellular localization. 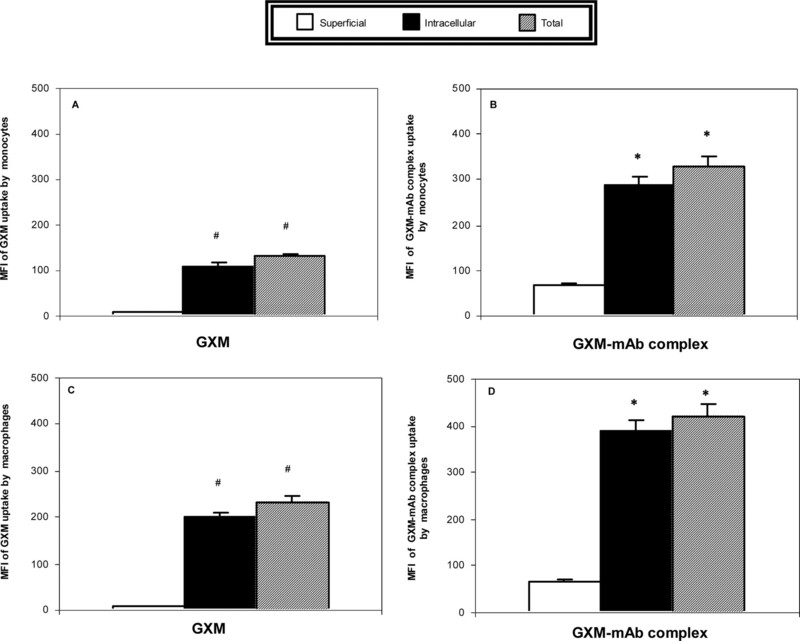 Cells (1 × 106/ml) were incubated with GXM or GXM-mAb complex, collected, fixed, washed twice in fluorescence buffer, and the surface bound GXM or GXM-mAb complex were evaluated by incubation with appropriate Abs. The intracellular pool of GXM or GXM-mAb complex was calculated by subtracting surface bound GXM or GXM-mAb complex from total uptake. Specific fluorescence for GXM was assessed by comparison with results from an IgG1κ isotype control, and specific fluorescence for GXM-mAb complex was evaluated by comparison with results from GXM-IgG1κ complex. Autofluorescence was assessed using untreated cells. Monocytes (1 × 106) were incubated with Abs to FcγRI, FcγRII, FcγRIIA, FcγRIIB, or FcγRIII for 30 min at 4°C in RPMI 1640, washed, and incubated with GXM or with GXM-FLUOS/mAb complex in 1 ml of RPMI 1640 plus 10% FCS for 1 h at 37°C with 5% CO2. To determine the GXM or GXM-FLUOS/mAb complex uptake, the cells were collected, fixed, permeabilized, stained with FLUOS/mAb to GXM in the first case, and analyzed with FACScan (5000 events) as described previously (13). Specific fluorescence for GXM and for GXM-FLUOS/mAb complex was assessed as described above. Autofluorescence was assessed using untreated cells. In these experiments GXM-FLUOS/mAb complexes were used to avoid the interference of secondary Ab with mouse Abs to FcγRI, FcγRII, FcγRIIA, FcγRIIB, and FcγRIII. Monocytes (9 × 106) were incubated alone or with i) GXM, ii) GXM-mAb complex, or iii) mAb to GXM alone in 3 ml of RPMI for 4 h at 37°C with 5% CO2. After culture, the cells were washed, and lysated as previously described (13) in the presence of protease (Pierce) and phosphatase inhibitors (Sigma-Aldrich). Protein concentrations were determined with a BCA Protein Assay Reagent kit (Pierce), and the same quantity of protein for each sample was incubated overnight at 4°C with rabbit polyclonal specific for SHIP (2.5 μg/ml). After incubation, a 15 μl volume of Protein A-Sepharose suspension (Sigma-Aldrich) was added and samples were incubated an additional 2 h at 4°C. The beads were then washed in 1 ml of M-PER, resuspended in M-PER plus Laemmli buffer and boiled for 3 min. The lysates (30 μg of each sample) were separated by sodium dodecyl-sulfate-10% PAGE, transferred to a nitrocellulose membrane (Pierce) for 1 h at 100 V in a blotting system (Bio-Rad) for Western blot analysis, and the membranes were incubated overnight with rabbit polyclonal Ab to phospho-tyrosine (dilution 1/10,000) in blocking buffer. The membranes were stained with a labeling kit according to the manufacturer’s directions (WesternBreeze Chemiluminescent Western Blot Immunodetection kit; Invitrogen Life Technologies), and immunoreactive bands were visualized with ChemiDoc molecular imager (Bio-Rad). To determine SHIP activation, the cells were treated with GXM for 4 h. This incubation time was chosen on the basis of results obtained with time course experiments. MonoMac-1 (9 × 106) were incubated alone or with 1) LPS, 2) GXM, 3) GXM-mAb complex, or 4) mAb to GXM in 3 ml of RPMI 1640 for 4 h at 37°C with 5% CO2. After culture, the cells were treated as described elsewhere (13). The membranes were incubated for 1 h at room temperature in a blocking buffer probed with rabbit Ab specific for phospho-IκB-α (Ser32) overnight at 4°C in blocking buffer and stained as described in the preceding paragraph. To investigate the role of FcγRII, FcγRIIA, FcγRIIB in phospho-ΙκΒα activation, MonoMac-1 (6 × 106) were incubated for 30 min at 4°C, alone, or in the presence of mAb to FcγRII, FcγRIIA, or FcγRIIB, washed, incubated with GXM or GXM-mAb complex in 1 ml of RPMI 1640 at 5% of FCS for 30 min at 37°C with 5% CO2, and analyzed for phospho-IκBα as described in the preceding paragraph. Preliminary experiments were performed to establish the optimal incubation time for ΙκΒα activation. The Chemiluminescent signal was quantitated using Quantity One quantitation software (Bio-Rad). To quantitate the phospho-specific signal in the activated samples, we subtracted background and plotted the values as fold increase over unstimulated samples. Monocytes (5 × 106/ml) were incubated alone or in the presence of mAb to FcγRII, FcγRIIA, or FcγRIIB. The cells were washed and incubated either alone or with 1) GXM, 2) GXM-mAb complex, or 3) mAb to GXM for 18 h (for TNF-α) or 48 h (for IL-10) in RPMI 1640 with 10% of FCS. To determine the role of FcγRII in GXM-regulation of LPS-induced TNF-α production, the cells were incubated with Abs to FcγRII incubated with LPS alone or with GXM, GXM-mAb complex, or mAb to GXM in the presence or absence of LPS for 18 h.
To evaluate whether GXM-induced IL-10 production may be the result of enhanced transcription, actinomycin D (1 μg/ml) was added to monocytes 30 min before GXM challenge. Cell viability was >98% after treatment with actinomycin D. Cell viability was measured with a colorimetric MTT viability assay (Aldrich Chemical) (36). In selected experiments to determine the connectivity between IL-10 or TGF-β and TNF-α, we incubated monocytes with GXM in the presence or absence of mAb to IL-10 (10 μg/ml) or mAb to TGF-β (10 μg/ml). Cytokine levels in supernatant fluids were measured with an ELISA kit for human TNF-α (ImmunoTools) or IL-10 (Bender MedSystems). The incubation time for cytokine secretion was chosen on the basis of our preliminary experiments in which we observed that the optimal incubation time for TNF-α secretion was within 18 h and for IL-10 production, within 48 h (9). Data are reported as the mean ± SEM from replicate experiments and were evaluated by ANOVA. Post hoc comparisons were done with Bonferroni’s test. A value of p < 0.05 was considered significant. We assessed the mean fluorescence intensity (MFI) and the percentage of cells positive for GXM after incubating monocytes or macrophages with GXM alone for 5, 15, 30, and 60 min. The MFI of monocytes and macrophages was relatively low after 5 or 15 min incubation with both types of cells. Similar low MFI values were observed in monocytes after 30 or 60 min of incubation (Fig. 1⇓A), whereas macrophages showed a noticeable increase of MFI at these time points (Fig. 1⇓C). Comparable percentages of GXM-positive cells were observed for monocytes and macrophages (Fig. 1⇓, B and D). Approximately 60% of cells contained GXM, consistent with our previous results obtained with macrophages, where a considerable percentage of macrophages were refractory to accumulation of GXM (13). These results extend this observation to monocytes. GXM and GXM-mAb complex accumulation by monocytes and macrophages. The cells (106/ml) were incubated for different time intervals at 37°C with GXM or with GXM-mAb complex. After incubation, the cells were washed, and GXM or GXM-mAb complex uptake was evaluated as described in Materials and Methods. A and C show the MFI of GXM or GXM-mAb complex uptake by monocytes and macrophages; B and D show the percentage of positive monocytes and macrophages for GXM or GXM-mAb complex. The MFI or percentage of cells treated with isotype control Ab or irrelevant Ab was similar to that of untreated cells (MFI < 15). Bars represent the mean ± SEM of five experiments. ∗, p < 0.05 (MFI of GXM-mAb complex at 30 and 60 min vs 5 min of incubation with monocytes); #, p < 0.05 (MFI of GXM at 30 and 60 min vs 5 min of incubation with macrophages). We then assessed the capacity of mAb to GXM to regulate GXM uptake in these cells. Monocytes or macrophages were incubated for various time intervals with preformed GXM-mAb complexes. MFI values showed that the amount of GXM taken up by monocytes and macrophages was appreciably higher in the presence of mAb to GXM with respect to GXM alone, particularly in the case of monocytes (Fig. 1⇑, A and C). Although the percentage of monocytes and macrophages that did not uptake GXM (∼40%) and GXM-mAb complex (∼25%) did not change substantially over time, we observed that macrophages showed a significantly higher rate of GXM accumulation with respect to monocytes in terms of kinetics and quantity of engaged material. Furthermore, the percentage of positive cells for these cell types did not show a significant increase when mAb to GXM was used (Fig. 1⇑, B and D). In attempting to clarify what renders the cell refractory to GXM or to the GXM-mAb complex, we analyzed the expression of FcγRIIA and FcγRIIB in macrophages that did or did not take up GXM or the GXM-mAb complex. The results showed that both isoforms were completely absent in both GXM and GXM-mAb complex negative cells (data not shown). Moreover, GXM and the GXM-mAb complex were almost totally internalized by both monocytes and macrophages (Fig. 2⇓, A and C). In agreement with results shown in Fig. 1⇑, more of the GXM-mAb complex was internalized than GXM alone (Fig. 2⇓, B and D), and macrophages showed increased ingestion relative to monocytes (Fig. 2⇓). However, the proportion of ingested GXM was similar in both cases. Localization of GXM and GXM-mAb complex on monocytes and macrophages. The cells (106/ml) were incubated for 1 h at 37°C with GXM or with GXM-mAb complex. After incubation, the cells were stained to determine the total, intracellular, or surface pool of GXM (A and C) or GXM-mAb complex (B and D) as described in Materials and Methods. Bars represent the mean ± SEM of three experiments. #, p < 0.05 (MFI of intracellular and total GXM vs MFI of superficial GXM). ∗, p < 0.05 (MFI of intracellular and total GXM-mAb complex vs MFI of superficial GXM-mAb complex). GXM is recognized by cells through several cell surface receptors, including TLR4, CD14 (12), CD18 (11), and FcγRII (13). GXM complexed with IgG1 should be recognized by FcγRI, FcγRII, and FcγRIII. FcγRI and FcγRIII transmit activating signals (15). We performed experiments blocking FcγRII and the two isoforms FcγRIIA and FcγRIIB on monocytes. Monocytes were used instead of macrophages for two reasons: 1) we observed that the expression of pattern recognition receptors for GXM is similar for both types of cells, and 2) from our previous experiments we observed that, despite greater ingestion of GXM, macrophages were less efficient in responding to GXM than monocytes, at least in terms of GXM-induced regulation of cytokine production (9). The results showed that the FcγRII blockade significantly inhibited uptake of GXM alone (Fig. 3⇓A). This inhibition is due to the FcγRIIB isoforms; blockade using anti-FcγRIIB produced an inhibition comparable to blockade using anti-FcγRII, whereas blockade using anti-FcγRIIA produced only a slight effect that was not significant. GXM accumulation was not blocked by Abs to FcγRI and FcγRIII, which is consistent with our previous observations (13). Inhibition of GXM or GXM-mAb complex uptake by Abs to FcγRs on monocytes. The cells (106/ml) were incubated for 30 min at 4°C with Ab to FcγRI, FcγRII, FcγRIIA, FcγRIIB, or FcγRIII. 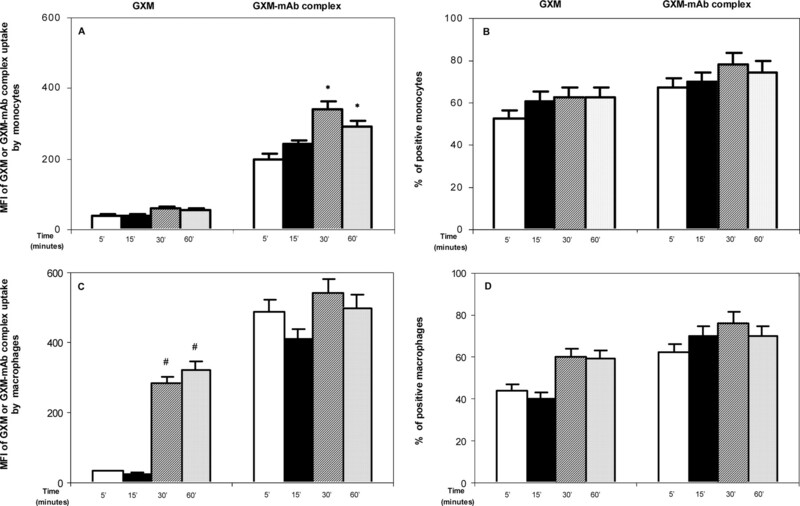 After incubation, the cells were washed and treated for 60 min at 37°C with GXM or GXM-mAb complex, and MFI of GXM (A) or of GXM-mAb (B) uptake was evaluated as described in Materials and Methods. 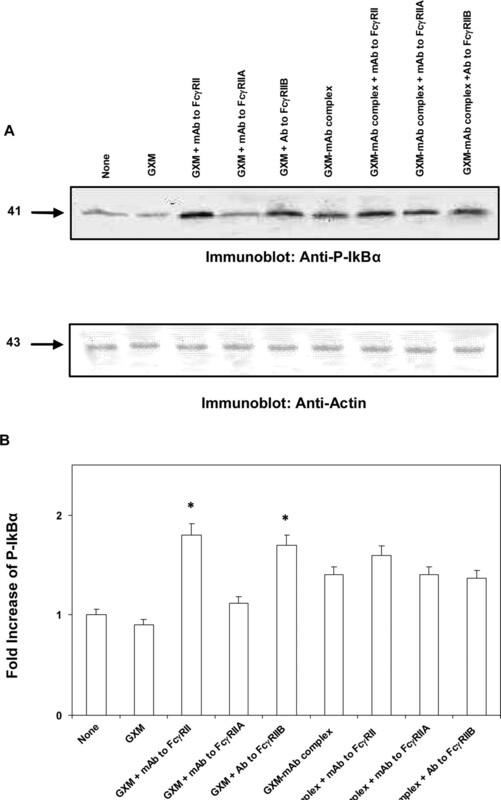 The MFI of cells treated with isotype control Ab or irrelevant Ab was similar to that of untreated cells (MFI < 15). Bars represent the mean ± SEM of five experiments. #, p < 0.05 (MFI of GXM-treated cells incubated with mAb to FcγRII or Ab to FcγRIIB vs GXM-treated cells). ∗, p < 0.05 (MFI of GXM-mAb-treated cells incubated with mAb to FcγRII or mAb to FcγRIIA vs GXM-mAb-treated cells). Since complexing GXM to an IgG1 mAb can counteract or bypass the immunosuppressive effects exerted by GXM alone (37), we hypothesized that, in contrast to recognition of GXM by FcγRII alone, the GXM-mAb complexes were recognized through FcγRI, II, and III. We therefore investigated the effect of FcγR blockade on accumulation of GXM-mAb complexes. Significant inhibition was observed after blocking Ab to FcγRI, FcγRII, FcγRIIA, and Fcγ RIII but not Fcγ RIIB (Fig. 3⇑B). We performed similar experiments by using dendritic cells derived from monocytes. The results obtained with dendritic cells were similar to those observed with monocytes (data not shown). In addition, by blocking all pattern recognition receptors involved in GXM uptake (CD18, CD14, TLR4, TLR2, and FcγRII), we observed that GXM uptake was inhibited by >85%. Moreover, when blocking all receptors, except for one (CD18 or CD14 and so forth) we noted that FcγRII was the main receptor involved in GXM uptake. It resulted in being responsible for 70% uptake, while TLR4 was responsible for 40%. The inhibitory effects triggered by FcγRIIB depend on specific recruitment of SHIP to the receptor complex (16). As a consequence, we assessed the possible involvement of SHIP phosphorylation in GXM/FcγRIIB interaction. The results showed that addition of GXM to monocytes induced SHIP phosphorylation, visible after 4 h of incubation. In contrast, there was no up-regulation of SHIP expression by the GXM-mAb complex (Fig. 4⇓A). GXM induces SHIP (A) but not IκBα (B) phosphorylation. A, Monocytes were incubated for 4 h alone (none) or with 1) GXM, 2) GXM-mAb complex, or 3) mAb to GXM. SHIP protein was immunoprecipitated from untreated and treated cells and assayed for tyrosine phosphorylation by immunoblotting with anti-phosphotyrosine Ab. The membrane was reprobed with anti-SHIP Ab to ensure equal loading in all lanes. SHIP phosphorylation signals were quantitated and shown as fold increase of cells treated over untreated. Incubation with mAb to GXM did not induce tyrosine phosphorylation. B, Monocytes were incubated for 4 h alone (none) or with LPS or GXM or GXM-mAb complex, or with mAb to GXM. Whole cell lysates were analyzed by Western blotting with phospho-IκBα. The membrane was reprobed with anti-actin Ab to ensure equal loading in all lines. IκBα phosphorylation signals were quantitated and shown as fold increase of cells treated over resting. Upper panels, Representative results from one of three independent experiments; lower panels, mean ± SEM of three independent experiments. A, Lower panel, ∗, p < 0.05 (GXM-treated cells vs untreated cells). B, Lower panel, ∗, p < 0.05 (LPS-treated cells vs untreated cells); #, p < 0.05 (GXM-mAb complex-treated cells vs untreated cells). NF-κB activation is responsible for proliferation and inflammatory response (38). A group of inhibitory proteins, belonging to the IκB family, regulate NF-κB activation. IκBα is rapidly phosphorylated under stimulation and operates the translocation of NF-κB into the nucleus (39). Therefore, we assessed the phosphorylation of IκBα in MonoMac-1 cells stimulated with GXM, GXM-mAb complex, and with LPS as a positive control. 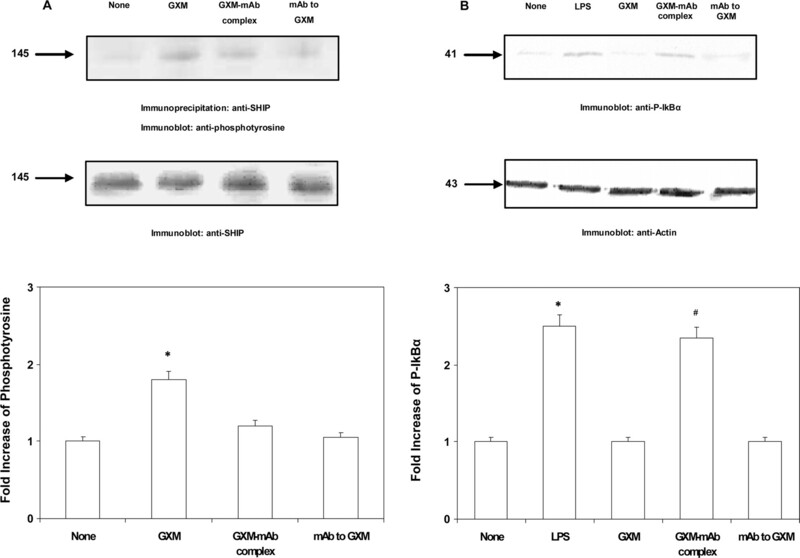 GXM stimulation did not produce IκBα phosphorylation in MonoMac-1 cells, conversely the GXM-mAb complex-activated IκBα (Fig. 4⇑B). To investigate the role of FcγRII in regulation of ΙκΒα activation by GXM, MonoMac-1 cells were treated for 30 min at 4°C with Abs to FcγRII, FcγRIIA, or FcγRIIB. The cells were then stimulated with GXM or GXM-mAb for 30 min at 37°C. The results (Fig. 5⇓) show that by blocking FcγRII, GXM treatment produced IκBα activation. This effect was mainly mediated by FcγRIIB. In contrast, FcγRIIA blockade did not produce any modulation, which is consistent with a limited ability of Ab to FcγRIIA to block GXM binding (Fig. 3⇑). Conversely, the ability of GXM-mAb complex to induce IκBα phosphorylation was not influenced by FcγRII blockade (Fig. 5⇓). IκBα phosphorylation is reversed by FcγRIIB GXM uptake blockade. MonoMac-1 cells were incubated for 30 min at 4°C in the presence or absence of mAb to FcγRII or mAb to FcγRIIA or Ab to FcγRIIB, washed, and incubated for 60 min at 37°C either alone (none), or with GXM, GXM-mAb complex, or mAb to GXM. Whole cell lysates were analyzed by Western blotting with phospho-IκBα (A). The membrane was reprobed with anti-actin Ab to ensure equal loading in all lines (A). IκBα phosphorylation signals were quantitated and shown as fold increase of cells treated over resting (B). The addition of mAb to GXM to untreated cells did not induce P-IκBα phosphorylation. These results are representative of five independent experiments. A, Representative results from one of five independent experiments; B, mean ± SEM of five independent experiments. ∗, p < 0.05 (mAb to FcγRII or mAb to FcγRIIB plus GXM-treated vs GXM-treated cells). Given that IL-10 plays an important role in GXM-mediated immunosuppression, we considered whether the GXM/FcγRII interaction affected IL-10 secretion by GXM-loaded monocytes. The monocytes were incubated for 30′ in the presence or absence of mAb to FcγRII or mAb to FcγRIIA or Ab to FcγRIIB. The cells were then washed and incubated either alone (none), or with GXM or GXM-mAb complex or with mAb to GXM for 48 h. The results (Fig. 6⇓A) show that mAb to FcγRII drastically inhibited GXM-induced IL-10 production, and this inhibition was ascribed to the FcγRIIB isoform. FcγRIIA blockade did not interfere with IL-10 production. In contrast, the GXM-mAb complex did not induce production of IL-10, and the blockade of these receptors did not influence IL-10 levels in any way. Effect of FcγRIIB blockade on IL-10 (A) and TNF-α (B) production. Monocytes were incubated in the presence or absence of mAb to FcγRII or mAb to FcγRIIA or Ab to FcγRII B. The cells were then washed and incubated either alone (none), or with GXM or GXM-mAb complex or with mAb to GXM. The determination was performed with supernatant fluids harvested from the cells using a specific assay as described in Materials and Methods. The results reported are the means + SEM of three experiments. ∗, p < 0.05 (mAb to FcγRII plus GXM-treated vs GXM-treated cells); #, p < 0.05 (Ab to FcγRIIB plus GXM-treated vs GXM-treated cells); †, p < 0.05 (Ab to FcγRIIA plus GXM-mAb complex-treated vs GXM-mAb complex-treated cells). To evaluate whether GXM-induced IL-10 production was the result of enhanced transcription from preexisting pool, we added actinomycin D, a compound that interferes with protein synthesis through its effect on RNA transcription. To this end, actinomycin D (1 μg/ml) was added to monocytes 30 min before GXM challenge, and the cells were then incubated for another 48 h. IL-10 production was not appreciable in culture supernatant fluid of actinomycin D-treated cells. GXM alone is unable to induce TNF-α production, thus we hypothesized that FcγRIIB could be implicated in inhibiting the secretion of this cytokine. To this end, we stimulated monocytes with GXM or GXM-mAb complexes in the presence or absence of Ab to FcγRII, FcγRIIA, or FcγRIIB. The results (Fig. 6⇑B) show that there was a significant increase in GXM-mediated TNF-α secretion with FcγRIIB blockade. Conversely, there was a reduction of GXM-mAb complex-induced TNF-α, with FcγRIIA blockade. We have demonstrated in previous reports that GXM reduces TNF-α secretion induced by LPS (8) and that the addition of a GXM specific mAb enhances TNF-α production in response to C. neoformans (25). Therefore we investigated the role of FcγRIIA and FcγRIIB in the regulation of LPS-mediated TNF-α production. The cells were incubated alone or with Abs to FcγRII, FcγRIIA or FcγRIIB for 30 min at 4°C, recovered and incubated with GXM or GXM-mAb complex or mAb to GXM in the presence or absence of LPS for 18 h. The results (Table I⇓) show that the suppressive effect of GXM on LPS-induced TNF-α was reversed by blocking FcγRIIB. Conversely, stimulation with GXM-mAb complexes produced an increase in LPS-induced TNF-α secretion that was unaffected by blockade of FcγRII and relative isoforms (Table I⇓). To evaluate a possible connection between IL-10 and TNF-α production, IL-10 was blocked by addition of mAb to IL-10, and TNF-α production in response to GXM stimulation was assessed. The results (Table II⇓) showed a significant enhancement of TNF-α production in the presence of mAb to IL-10. Moreover, we observed that after GXM addition, TGF-β was significantly increased (C. Monari, unpublished data) with respect to untreated cells and that blockade of this cytokine, by using mAb to TGF-β, significantly increased TNF-α production (Table II⇓). GXM is an immunosuppressive compound that dampens the immune response through a variety of mechanisms that include inhibition of inflammatory responses (26), T cell proliferation and Th1 response (10). GXM is able to induce apoptosis of T cells (7). Many of these effects are counteracted by the GXM-mAb complex, which transmits positive signals that result in the generation of effective immunity. Consequently, Ab therapy is being developed for the treatment of human cryptococcosis; the IgG1 mAb used in this study has been evaluated in a phase I/II trial in patients with AIDS-related cryptococcosis (40). The mechanism by which GXM mediates immunosuppression has been the subject of many studies because this polysaccharide is believed to hold the key to C. neoformans virulence. Multiple immune receptors are involved in recognizing GXM, including TLR4, CD14, CD18, and FcγRII (13). In general, engagement of TLR4 by microbial compounds triggers activation of NF-κB, which culminates in the induction of inflammatory and antimicrobial response (41). However, GXM interaction with TLR4 is insufficient to activate the immune response, presumably because GXM also induces parallel immunosuppressive effects. GXM-mediated immunosuppression may be a consequence of the interaction of this polysaccharide with other immune receptors. The feature that identifies a receptor as inhibitory is its ability to attenuate the activation signals transmitted by other receptors. Notably, GXM and GXM-mAb complexes share the ability to interact with FcγRII, a type of receptor that can transmit activating and inhibitory signals respectively, depending on which isoform is engaged. In the present study, we further characterized the interactions between GXM, GXM-mAb complexes and monocytes and macrophages. Our new findings demonstrated that 1) macrophages are more receptive than monocytes to GXM, and to the GXM-mAb complex; 2) GXM, and to a greater extent, the GXM-mAb complex, is internalized with similar kinetics by monocytes and macrophages; 3) FcγRII recognizes GXM as well as the GXM-mAb complex; 4) the FcγRIIA isoform is involved in the engagement of the GXM-mAb complex, whereas FcγRIIB is involved in the engagement of GXM; 5) GXM treatment leads to recruitment and phosphorylation of SHIP; 6) IκBα, which plays a well-known role in the regulation of immune responses and inflammation, is activated by the GXM-mAb complex, but not by GXM alone; and 7) FcγRIIB is involved in GXM-mediated IL-10 production and in inhibition of LPS-induced TNF-α production. Our studies, as well as others, demonstrated that the GXM-mAb complex counteracts the suppression exerted by GXM (20, 37, 42). This suggests an essential role for macrophages in acquiring and storing GXM in various organs and is consistent with previous observations of GXM accumulation inside tissue macrophages in vivo (43, 44). The mechanism responsible for enhanced GXM accumulation inside macrophages as opposed to monocytes is unknown. Possible explanations are that monocytes promptly expel or degrade part of the GXM or that macrophages exhibit a greater amount or activity of functional receptors involved in GXM or GXM-mAb complex uptake. Furthermore, in the present study, we provide evidence that a subpopulation of macrophages unable to take up GXM or GXM-mAb complex is completely lacking in FcγRIIA and FcγRIIB isoforms. Intriguing questions that remain to be answered are why these cells do not express FcγRII, whether they are also missing other pattern recognition receptors and what their biological functions are. In this study, we demonstrate that two isoforms, FcγRIIA and FcγRIIB, are involved in recognition of immune complexes and of GXM, respectively. FcγRIIA is regarded as an activator of multiple intracellular pathways (45); in contrast FcγRIIB has inhibitory functions because of its ITIM, that activates the SHIP (46). Indeed, engagement of FcγRIIB by GXM leads to recruitment on macrophages of SHIP, a molecule considered a mediator of cellular activation/inhibition. Moreover, inhibitory signaling ascribed to the SHIP molecule has been well documented (16). However we cannot exclude that GXM binding to FcγRIIB may involve coreceptors that also deliver inhibitory signals. When both activating and inhibitory receptors are engaged by their ligands, the net outcome is determined by the relative strength of these opposing signals. The results reported in this study strongly suggest that the activating signals transmitted by GXM via TLR4 are completely overcome by the suppressive effects exerted by immune inhibitory receptor FcγRIIB via SHIP recruitment (Fig. 7⇓). It is noteworthy that FcγRIIA senses the GXM-mAb complex, providing an explanation for the previously reported extraordinary activation of innate and adaptive immune response documented for this Ab (37). This is consistent with phosphorylation of IκBα; however, it is plausible that other receptors such as FcγRIII and FcγRI are engaged by the GXM-mAb complex and cooperate to trigger activation signals. Interestingly, the recruitment of SHIP appears to down-regulate NF-κB gene transcription during GXM internalization via FcγRIIB. In contrast, the engagement of the GXM-mAb complex to FcγRIIA that precludes the activation of SHIP, induces NF-κB activation (Fig. 7⇓). Schematic representation of intracellular signaling triggered by GXM or GXM-mAb complex: two sides of the same coin. GXM induces negative signals via inhibitory receptor, FcγRIIB, and SHIP recruitment. GXM-mAb complex induces activating signals via activating FcγRIIA. The GXM-mAb complex can bind to other activating FcγR besides FcγRIIA, such as FcγRI and FcγRIII. Based on these results, the engagement of different isoforms of FcγRII by microbial products complexed or uncomplexed with a specific Ab could lead to potent opposite immunoregulatory effects that could be predicted, avoided or amplified by manipulating these immune receptors. It is noteworthy that the engagement of FcγRIIB leads to GXM-induced IL-10 production and that the blockade of this receptor completely abrogated the release of this cytokine. 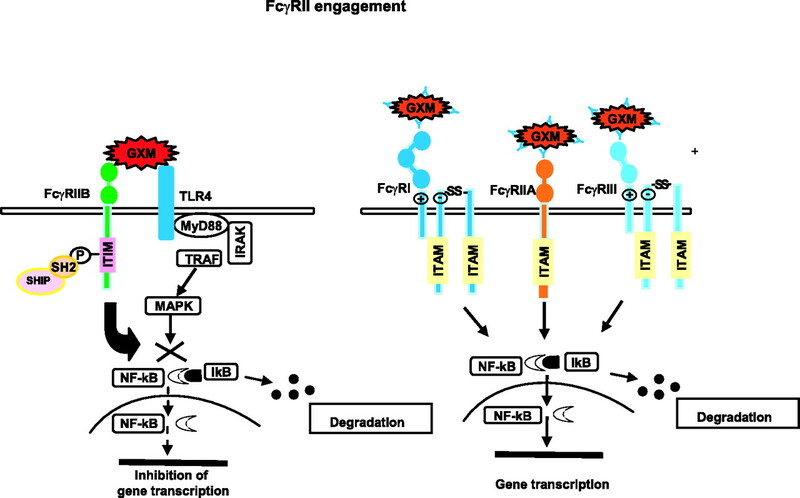 Conversely, a significantly increased amount of TNF-α is secreted in response to GXM by blocking FcγRIIB, suggesting that the engagement of GXM by other receptors such as TLR4 and CD18 when FcγRIIB is unavailable, could trigger activation signals. This result implies that the immunoinhibitory activity of GXM is essentially transmitted via FcγRIIB. On the other hand, the function of the GXM-mAb complex in reversing the suppression is due to its capacity to shift the recognition from FcγRIIB to the other receptors. In the present study, we demonstrate that when bypassing FcγRIIB engagement, not only is the suppressive effect of GXM abrogated, but most importantly, GXM could exert stimulatory activity such as TNF-α induction. Thus, we provide evidence that the suppression is not due to an intrinsic immunosuppressive property of GXM, considered the principal virulence factor of C. neoformans, but rather to its capacity to engage potent immunoinhibitory receptors. This in turn, provides an explanation for the immunostimulating properties ascribed to the GXM-mAb complex, despite the great amount of GXM accumulated inside the cells. Interestingly, the GXM-mediated suppression of LPS-induced TNF-α production could be largely abrogated when bypassing FcγRIIB engagement. Thus, the blockade of LPS-induced cellular activation by GXM, is largely due to the ability of FcγRIIB engagement to counterbalance the LPS activating signal. As a consequence, the effector response may be influenced by regulating the ratio of activating/inhibitory receptors and by controlling the levels of SHIP activity. Conversely, the GXM-mAb complex induces an inflammatory response and amplifies the LPS effect largely through engagement of FcγRIII and FcγRIIA. In summary, our results explain the immunosuppressive effects of GXM in the context of direct engagement of inhibitory receptors. Given that FcγR signaling requires the aggregation of receptor monomers on the cell surface, we posit that the large m.w. of GXM, combined with a repeating polysaccharide motif, allows for engagement of several receptors simultaneously. Furthermore, we show that reversal of GXM-mediated immunosuppression by an IgG1 GXM-binding mAb is a result of the shifting of the type of receptor that is engaged. The ability of specific Ab to abolish the immunosuppressive effects of GXM could represent a direct interference with the polysaccharide motifs that bind FcγRIIB or an increased affinity by the mAb-GXM complex for other FcγR. These findings highlight a mechanism by which specific Ab can reverse the inhibitory effects mediated by a microbial molecule and may serve as a precedent for Ab action in other systems. Finally, our findings demonstrate a mechanism by which Ab to GXM contributes to defense against C. neoformans and provides additional support for the continued development of Ab therapies against this disease. We thank Gabriella F. Mansi for excellent editorial and secretarial assistance. ↵1 This work was supported by the National Institute of Health AIDS Project No. 50 F.36, Basic Research Investment Funds Project No. RBLA03C9F4_006, Public Health Service Grant AI14209, and from the National Institute for Allergy and Infectious Diseases (to T.R.K.). A.C. is supported in part by Public Health Service Grant HL059842. ↵3 Abbreviations used in this paper: GXM, glucuronoxylomannan; MFI, mean fluorescence intensity; P-, phospho-; FLUOS, 5(6)-carboxyfluorescein-N-hydroxysuccinimide ester. Monari, C., T. R. Kozel, A. Casadevall, D. Pietrella, B. Palazzetti, A. Vecchiarelli. 1999. B7 costimulatory ligand regulates development of the T cell response to Cryptococcus neoformans. Immunology 98: 27-35. Pietrella, D., C. Monari, C. Retini, B. Palazzetti, T. R. Kozel, A. Vecchiarelli. 1999. HIV type 1 envelope glycoprotein gp120 induces development of a T helper type 2 response to Cryptococcus neoformans. AIDS 13: 2197-2207. Vecchiarelli, A., D. Pietrella, P. Lupo, F. Bistoni, D. C. McFadden, A. Casadevall. 2003. The polysaccharide capsule of Cryptococcus neoformans interferes with human dendritic cell maturation and activation. J. Leukocyte Biol. 74: 370-378. Syme, R. M., T. F. Bruno, T. R. Kozel, C. H. Mody. 1999. The capsule of Cryptococcus neoformans reduces T lymphocyte proliferation by reducing phagocytosis, which can be restored with anticapsular antibody. Infect. Immun. 67: 4620-4627. Retini, C., A. Vecchiarelli, C. Monari, F. Bistoni, T. R. Kozel. 1998. Encapsulation of Cryptococcus neoformans with glucuronoxylomannan inhibits the antigen-presenting capacity of monocytes. Infect. Immun. 66: 664-669. Retini, C., A. Casadevall, D. Pietrella, C. Monari, B. Palazzetti, A. Vecchiarelli. 1999. Specific activated T cells regulate IL-12 production by human monocytes stimulated with Cryptococcus neoformans. J. Immunol. 162: 1618-1623. Vecchiarelli, A., C. Retini, D. Pietrella, C. Monari, C. Tascini, T. Beccari, T. R. Kozel. 1995. Down-regulation by cryptococcal polysaccharide of tumor necrosis factor α and interleukin-1β secretion from human monocytes. Infect. Immun. 63: 2919-2923. Vecchiarelli, A., C. Retini, C. Monari, C. Tascini, F. Bistoni, T. R. Kozel. 1996. Purified capsular polysaccharide of Cryptococcus neoformans induces interleukin-10 secretion by human monocytes. Infect. Immun. 64: 2846-2849. Retini, C., T. R. Kozel, D. Pietrella, C. Monari, F. Bistoni, A. Vecchiarelli. 2001. Interdependency of interleukin-10 and interleukin-12 in regulation of T cell differentiation and effector function of monocytes in response to stimulation with Cryptococcus neoformans. Infect. Immun. 69: 6064-6073. Dong, Z. M., J. W. Murphy. 1997. Cryptococcal polysaccharides bind to CD18 on human neutrophils. Infect. Immun. 65: 557-563. Shoham, S., C. Huang, J. M. Chen, D. T. Golenbock, S. M. Levitz. 2001. Toll-like receptor 4 mediates intracellular signaling without TNF-α release in response to Cryptococcus neoformans polysaccharide capsule. J. Immunol. 166: 4620-4626. Monari, C., F. Bistoni, A. Casadevall, E. Pericolini, D. Pietrella, T. R. Kozel, A. Vecchiarelli. 2005. Glucuronoxylomannan, a microbial compound, regulates expression of costimulatory molecules and cytokine production in macrophages. J. Infect. Dis. 191: 127-137. Van den Herik-Oudijk, I. E., P. J. Capel, T. van der Bruggen, J. G. Van de Winkel. 1995. Identification of signaling motifs within human FcγRIIa and FcγRIIb isoforms. Blood 85: 2202-2211. Tridandapani, S., K. Siefker, J. L. Teillaud, J. E. Carter, M. D. Wewers, C. L. Anderson. 2002. Regulated expression and inhibitory function of FcγRIIb in human monocytic cells. J. Biol. Chem. 277: 5082-5089. Amigorena, S., C. Bonnerot, J. R. Drake, D. Choquet, W. Hunziker, J. G. Guillet, P. Webster, C. Sautes, I. Mellman, W. H. Fridman. 1992. Cytoplasmic domain heterogeneity and functions of IgG Fc receptors in B lymphocytes. Science 256: 1808-1812. Dromer, F., J. Salamero, A. Contrepois, C. Carbon, P. Yeni. 1987. Production, characterization, and antibody specificity of a mouse monoclonal antibody reactive with Cryptococcus neoformans capsular polysaccharide. Infect. Immun. 55: 742-748. Eckert, T. F., T. R. Kozel. 1987. Production and characterization of monoclonal antibodies specific for Cryptococcus neoformans capsular polysaccharide. Infect. Immun. 55: 1895-1899. Vecchiarelli, A., C. Retini, C. Monari, A. Casadevall. 1998. Specific antibody to Cryptococcus neoformans alters human leukocyte cytokine synthesis and promotes T cell proliferation. Infect. Immun. 66: 1244-1247. Vecchiarelli, A., C. Monari, C. Retini, D. Pietrella, B. Palazzetti, L. Pitzurra, A. Casadevall. 1998. Cryptococcus neoformans differently regulates B7-1 (CD80) and B7-2 (CD86) expression on human monocytes. Eur. J. Immunol. 28: 114-121. Monari, C., A. Casadevall, D. Pietrella, F. Bistoni, A. Vecchiarelli. 1999. Neutrophils from patients with advanced human immunodeficiency virus infection have impaired complement receptor function and preserved Fcγ receptor function. J. Infect. Dis. 180: 1542-1549. Monari, C., A. Casadevall, C. Retini, F. Baldelli, F. Bistoni, A. Vecchiarelli. 1999. Antibody to capsular polysaccharide enhances the function of neutrophils from patients with AIDS against Cryptococcus neoformans. AIDS 13: 653-660. Plesner, A., C. J. Greenbaum, A. Lernmark. 2001. Low serum conditions for in vitro generation of human macrophages with macrophage colony stimulating factor. J. Immunol. Methods 249: 53-61. Cherniak, R., E. Reiss, M. E. Slodki, R. D. Plattner, S. O. Blumer. 1980. Structure and antigenic activity of the capsular polysaccharide of Cryptococcus neoformans serotype A. Mol. Immunol. 17: 1025-1032. Houpt, D. C., G. S. Pfrommer, B. J. Young, T. A. Larson, T. R. Kozel. 1994. Occurrences, immunoglobulin classes, and biological activities of antibodies in normal human serum that are reactive with Cryptococcus neoformans glucuronoxylomannan. Infect. Immun. 62: 2857-2864. Mukherjee, S., S. C. Lee, A. Casadevall. 1995. Antibodies to Cryptococcus neoformans glucuronoxylomannan enhance antifungal activity of murine macrophages. Infect. Immun. 63: 573-579. Mukherjee, S., S. Lee, J. Mukherjee, M. D. Scharff, A. Casadevall. 1994. Monoclonal antibodies to Cryptococcus neoformans capsular polysaccharide modify the course of intravenous infection in mice. Infect. Immun. 62: 1079-1088. Monari, C., C. Retini, A. Casadevall, D. Netski, F. Bistoni, T. R. Kozel, A. Vecchiarelli. 2003. Differences in outcome of the interaction between Cryptococcus neoformans glucuronoxylomannan and human monocytes and neutrophils. Eur. J. Immunol. 33: 1041-1051. Pauwels, R., J. Balzarini, M. Baba, R. Snoeck, D. Schols, P. Herdewijn, J. Desmyter, E. De Clercq. 1988. Rapid and automated tetrazolium-based colorimetric assay for the detection of anti-HIV compounds. J. Virol. Methods 20: 309-321. Vecchiarelli, A.. 2005. The cellular responses induced by the capsular polysaccharide of Cryptococcus neoformans differ depending on the presence or absence of specific protective antibodies. Curr. Mol. Med. 5: 413-420. Baeuerle, P. A., T. Henkel. 1994. Function and activation of NF-κB in the immune system. Annu. Rev. Immunol. 12: 141-179. Zandi, E., D. M. Rothwarf, M. Delhase, M. Hayakawa, M. Karin. 1997. The IκB kinase complex (IKK) contains two kinase subunits, IKKα and IKKβ, necessary for IκB phosphorylation and NF-κB activation. Cell 91: 243-252. Muzio, M., N. Polntarutti, D. Bosisio, M. K. Prahladan, A. Mantovani. 2000. Toll like receptor family (TLT) and signalling pathway. Eur. Cytokine Netw. 11: 489-490. Grinsell, M., L. C. Weinhold, J. E. Cutler, Y. Han, T. R. Kozel. 2001. In vivo clearance of glucuronoxylomannan, the major capsular polysaccharide of Cryptococcus neoformans: a critical role for tissue macrophages. J. Infect. Dis. 184: 479-487. Lee, S. C., A. Casadevall, D. W. Dickson. 1996. Immunohistochemical localization of capsular polysaccharide antigen in the central nervous system cells in cryptococcal meningoencephalitis. Am. J Pathol. 148: 1267-1274. Engelhardt, W., H. Gorczytza, A. Butterweck, H. Monkemann, J. Frey. 1991. Structural requirements of the cytoplasmic domains of the human macrophage Fcγ receptor IIa and B cell Fcγ receptor IIb2 for the endocytosis of immune complexes. Eur. J. Immunol. 21: 2227-2238. March, M. E., K. Ravichandran. 2002. Regulation of the immune response by SHIP. Semin. Immunol. 14: 37-47.